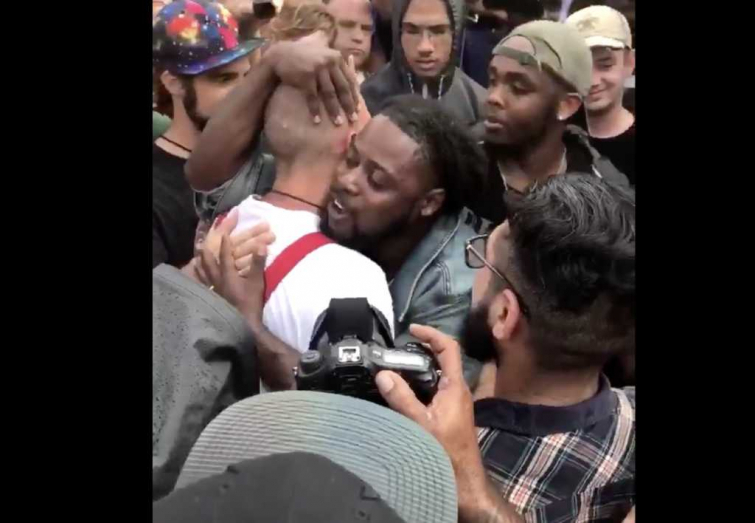 Black Man Hugs White Supremacist At Protest, Heard God Whisper "You Changed His Life"
A surprising bond occurred between a black man and a white supremacist at protests outside Richard Spencer’s University of Florida speech last Thursday, Faithwire reports. Aaron Courtney attended to protest Richard Spencer’s speech, but instead found himself having a thoughtful dialogue, and even a hug, with white supremacist Randy Furniss. Courtney said that during the embrace he "heard God whisper" into his ear that he had "changed his life". Courtney, a 31-year-old high school football coach, found himself “hurt and dismayed” when he learned about Spencer’s speech and showed up at the University of Florida to protest. There, he met Furniss, a counter-protestor. Refusing to submit to his frustration, Courtney instead embraced Furniss, a heartfelt moment which is now going viral online. “I reached over and the third time, he wrapped his arms around me, and I heard God whisper in my ear, ‘You changed his life,'” Courtney stated.